It’s been two weeks since the Fort Valley 50 and I’ve taken one short ride with Khaleesi to stretch her legs and played a pretty intensive faculty chamber music concert (including extra dress rehearsals) and spent a few days running creative strings clinics for orchestra students in the Northern Virginia area. When finally a ‘real’ day off and gorgeous weather presented itself I dreamed of the possibilities…. Then I began to consider what it might look like to my horse. I’ve barely shown up to feed and make sure she’s alive for two weeks and been completely absent a few days this week. So I zip back in from my human jet setting toss on the halter, boot & tack her up, load into the trailer and head for the trails… alone with many miles in mind. hi! It’s great to see you… I’m enjoying some down time.. what do you want to do today!? oh. You again? Great <sarcasm infused> let me guess, you’ve been busy and pretty much ignored me for days and now you want me to carry you a ton of miles alone on a new trail. Yipee. Let me just wander farther out into the field to see if you can read my body language that says I’d rather just stay here thanks. So I made the decision in advance that I wouldn’t make a real plan- but I’d go and see what felt right. I took my halter and after the mares ate I stood in the field and watched. The first thing I noticed as I just watched is Khaleesi looks great- she’s a little fuzzy right now and I opened up the extra grass for them while I was out of town and not throwing hay (so might have gained a couple pounds on extra fall grass for a few days), but her topline looks strong and she’s got nice muscling through her body. Her mane is less ‘bleached’ (which I understand can be a result of mineral or dietary imbalance) and has a healthier feel. Even more her feet and legs have really changed this year. Her legs are thicker from the increased blood flow through the legs into the feet since I pulled shoes and her feet are really healthy and the new growth doesn’t have the rings the older hoof does. They are nicely underneath her and everything about them seems healthy and supported. They still have some ways to go but I like the improvement. Of course Wild Heart comes right to me every time. She has a few things she wants to talk about, a couple of scratching requests, and likes to be close to me. So I began with her while K watched suspiciously from a few feet away. I decided then it was unlikely I would even take the girls into the barn today. Regardless of what I wanted to do for my own pleasure, what I needed to so was to let my favorite mare know that sometimes I can visit just to say hi and see if anyone has an itch they need help with. That I do care how she is doing and can slow down and spend some time checking in with her. WildHeart is very specific with her scratching needs. She shows exactly where to go and positions herself accordingly. As she got more and more heavenly relief Khaleesi inched closer. When I decided I was done with Heart for the moment (she could stand next to me getting scratched all day and night!) I took the few steps left to Khaleesi and she stayed put while I rubbed her withers and said hello to my beloved mare. I rubbed the velvety fur on her neck near her mane and scratched under her jaw. She then took a few steps so my scratching hand was positioned exactly at hind along the spine, then moved a little more … her back legs… she stretched out and relaxed. Wild Heart would inch in and I’d use my rope to ask her to move off not your turn right now. Don’t be so pushy. At one point Heart was so desperate for more scratching she laid right down in front of us and rolled around on the ground. That mustang is quite a character! I walked off to take a break and had exactly what I’d hoped for. Two horses who were now very interested in me. Khaleesi right behind my shoulder at a respectful distance not bugging me for anything but wanting to stay with me. In fact once when I stopped she squared up and faced me- I went to rub her and she moved just away don’t touch. I reminded myself that humans love to touch horses…. however many horses are more content just being close. K is one of those. She is ok with a well timed rub or scratch but she is often happier with quiet presence. I walked off and squatted in the grass and watched as well. The girls spent a little time interacting around the water trough with the geldings over the fence who had gradually assembled and were very interested in what was going on in our field. Before leaving I walked back to K, rubbed her then put on the halter… then immediately dropped it and walked away. 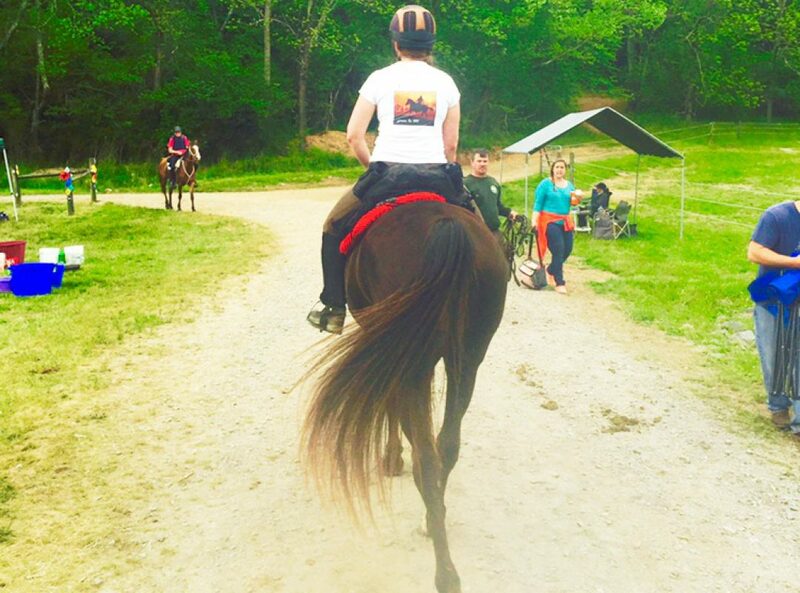 We have a lifetime of exploring new trails, of playing in the arena… but none of it will matter if my horse is hard to catch, avoids the trailer, or decides that I’m a selfish hurried human not worth with spending time with. I do care about you. I will not always put my needs and interests first. And I can behave peacefully and quiet like a horse. I will try to inhabit your world from time to time instead of forcing you into mine. I have also said before the only ride I regret is the one I didn’t take….. but in this case I don’t regret my time idle in the field watching my herd and spending some time in their world. Maybe it will remind me not only to ask what my horse can do for me….. but what can I do for my horse.